SILENT ScriptFTP will only show errors, transferred files and PRINT messages. All information other than that about the script run will be suppressed. NORMAL This is the default. ScriptFTP will show the command calls, command messages and any errors encountered during the script run. 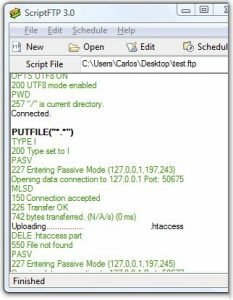 VERBOSE ScriptFTP will show the dialog with the FTP server, DNS resolving issues and connection loss messages. DEBUG Equivalent to VERBOSE but also show internal ScriptFTP messages. The dialog between ScriptFTP and the FTP server. This command is usually put at the beginning of a script file. This command always returns “OK”. This command was introduced in ScriptFTP version 4.1 to replace the VERBOSE and SILENT commands.